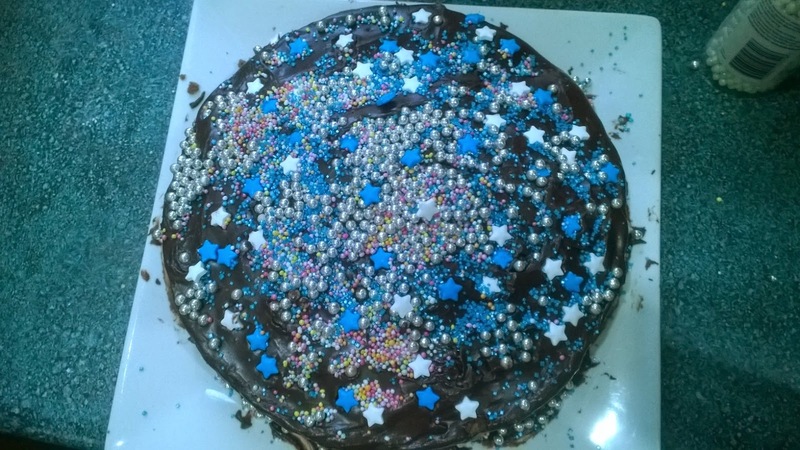 This baubley starry erm birthday cake was decorated by my baby girl and her friends for her 13th birthday a few weeks back. I am now the mother of a teenager. The girl who used to make my ears ache with her constant chatter now only grunts at me. She used to beg me to stay with her until the bell rang when I dropped her off at school. Now she just yells "Bye mum! "as she's walking out the door, and when I race after her to at least get a kiss, she already phoning or texting the friends she will see at the bus stop in the next 60 seconds. Where did those years go? This month also marked our 30th year high school reunion. All those fresh young faces are now middle aged women. (though now with a 13 year old in tow I somehow don't think I could get away with that one). As I move uncomfortably close to the half century I've realised a few things. 1. Looking back is pointless unless it brings a smile to your face. 2. I wouldn't change the wisdom I've gained for the smooth skin of my youth for anything. 3. It is possible to look great at any age - it just takes more work as you get older. 4. I'm ok with it. Daughter's cake creation - November 2014. That's a splendid cake! I've somehow got to be 60 and I still haven't decided what I want to be when I grow up! Get used to teenage-hood behaviour for a few years until she gradually comes into herself around nineteen or twenty and stops mumbling! I've never been to a high school reunion... and I don't think I ever will. Those I wanted to keep in touch with I have, and the rest are people I'd rather never see again. What a creative teenager you have, and I think with your outlook on life, you and she will survive it all quite well. I remember thinking I would be young forever too. But I wouldn't want to be 16 again! Your daughter is quite creative! Thank you William, Genie and EG CameraGirl, I certainly do have a creative girl. Si elle lit ton blog elle ne va pas aimer "baby girl" ! Very wise words. I find my age weighing on my mind considerably more since reaching 30 this July. I don't have qualms with it of course and am always happy to celebrate another birthday (it sure beats the alternative! ), but with three decades under my belt, I feel like I want to try even harder to make the most of my life in the years to come (and have a clear set of priorities and goals in mind as I go about doing that). Happiest (belated) birthday wishes to your darling daughter. That is such a pretty cake! I like to look back, though. Looking back, learning without flinching, is where the wisdom comes from. Jessica: I always say that to myself whenever I'm feeling old - that the alternative to aging isn't worth think about. what a super cake ... gone are the days of Barbie cakes and "Think Pink" parties but I'm sure your lovely daughter will survive and you will love her at every stage in her (and your) life.